The awe-inspiring view of Albuquerque can be had from nearly one mile (2km) above the city on top of Sandia Crest, the windy mountaintop where the view extends for over 1,000 miles (1,609km). 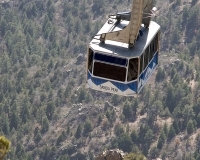 Simply follow Tramway Boulevard for a few miles north of the city to board the Sandia Peak Aerial Tramway, the world's longest continuous jigback passenger tramway, which makes the ascent from the foothills to the summit in about 20 minutes. In winter, skiers make use of the more than 30 trails descending from the mountain crest, while in summer hikers and mountain bikers can take the tramway up and enjoy nature on their way down. Pleasure seekers simply ride to the top to enjoy the view, which is particularly spectacular at sunset, and enjoy a meal at the High Finance Restaurant with its picture windows. Opening times: Daily 9am-9pm (summer), 9am-8pm in winter (5pm-8pm on Tuesdays); it does not operate on very windy days, and is closed for maintenance for two weeks every spring and autumn. Admission: $25 adults, $15 children 5-12; concessions available.